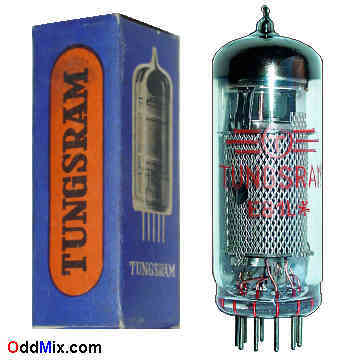 This is an original, high reliability Tungsram E81L Power Pentode electronic tube. Nearest preferred subtitute is the 6686 or the good EL861. This 10,000 hours certified, high reliability, shock and vibration resistant industrial tube is designed for AF [Audio Frequency] and RF [Radio Frequency] amplifier, oscillator use. Excellent part for replacement, antique radio, instrument or television restoration, circuit research, radio amateur experimentation. It is a NOS tube - New Old Stock, excellent condition.